Considering how accessible Gunung Kaba is, it is remarkable that it isn’t one of Sumatra’s most famous natural attractions. Not only is it reachable on a regular weekend from Jakarta (via a flight to Bengkulu) and close to a lovely hotel, there is also a narrow asphalt track up the mountainside followed by a couple of hundred steps up to the spectacular volcanic scenery that awaits on the crater rim. Given just how stunning the panorama is and how little effort is required to reap such a reward, it really doesn’t get any easier than this! The main road running from Bengkulu to Lubuk Linggau runs very close to Gunung Kaba, and, about 20km after the small city of Curup, reaches a height of 1,100 metres above sea level near a small lake. There are a couple of homestays in the area but a particularly peaceful and pleasant hotel is Vila Hijau which offers views over the lake and is just 1km east of the Gunung Kaba road junction. Just by asking the staff at the hotel it will be very easy to find a local chap with a motorbike to take you up the narrow track to the crater the following morning. Of course, you could visit in the afternoon – or even spend a night camping up there – but the finest views are usually to be had during the hours immediately after sunrise. Gunung Kaba is signposted ‘Bukit Kaba’ (Kaba Hill) on the main road near Desa Sumber Bening and Desa Karang Jaya but , in any case, most local people will be able to tell you where the junction is (‘simpang Bukit Kaba’). After less than 15 minutes on a motorbike you will reach the entrance gate – a metal pole across the road (1,310m) – but, assuming you’re up before it becomes staffed at 8am, you will probably have to pay the small entrance fee on the way back down. At this point you do actually have two options. You could hike for about 1 and a half or 2 hours on a different jungle path near the entrance gate or you could stay on your motorbike and continue up the road, under another entrance (1,360m), and zoom up the narrow, occasionally overgrown track that leads all the way (past a new shelter at 1,485m) to just below the largest crater. Given that it takes just 30 minutes on the motorbike (or just over 2 hours by foot as it is slightly less direct than the jungle path) most people don’t mind ‘cheating’ on this occasion! It is probably good advice to expect to get your trousers wet with morning dew and to wear a hat and sunglasses to avoid any of the dense vegetation from scratching your skin. There are one or two places where you will have to get off the motorbike and crouch under a fallen tree and the track deteriorates at one particular point higher up before widening to a small motorbike parking area and the remains of a cement building (1,875m) which presumably once housed a small shop selling snacks. From here the views are spectacular. The mysterious Gunung Pasu lies to the north over on the other side of the valley. From here it’s an easy 5 minute (maximum!) climb up about 200 cement steps to the edge of the crater rim (1,925m). In good weather, the view is one of the finest in Sumatra. The crater is perhaps 200 metres deep and approximately 1.2 kilometres wide, with near vertical cliffs. On the floor of the crater are numerous fumaroles and a small, pale blue lake. You may even spot Gunung Dempo in the far distance to the south. A cement ‘fence’ is in place to stop people wandering too close to the edge but this crumbles to northing just metres either side of the top of the cement staircase. 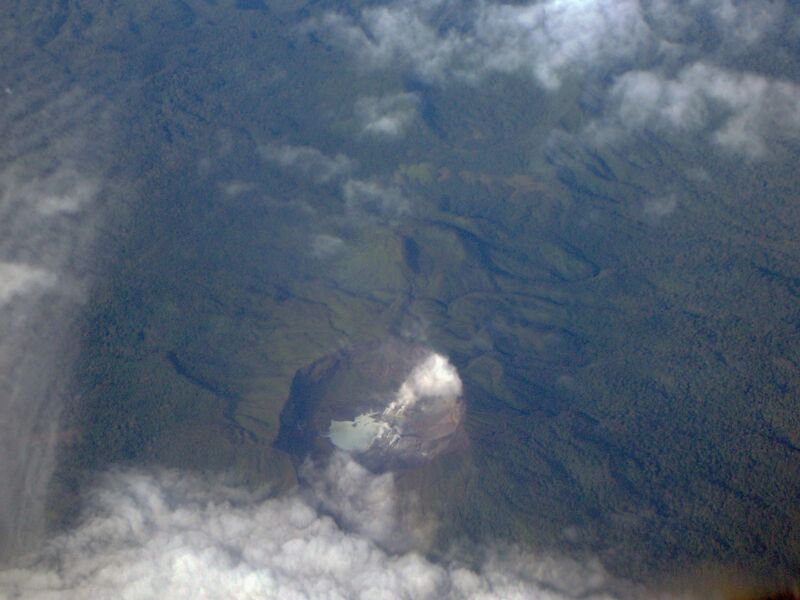 This crater is Kaba’s largest and is known as either Kawah Lama “(‘old crater’) or Kawah Besar (‘big crater’). As you will see a little later, there are other craters to see nearby. Wonderfully, a circuit of the crater rim is possible and not technically demanding. A trail leads all the way round and takes just over two hours. This is recommended for the careful and adventurous because there are one or two places where you can take some excellent photographs and you also get to know the mountain complex a little better. If you hike anti-clockwise, the first top you will reach is a rocky peak (1,940m) just five minutes away from the top of the staircase. Local people often leave spiritual offerings here. Just beyond this peak is a cement marker from where you will enjoy pleasant views over the city of Curup and to Gunung Daun beyond. Continuing on and after another half an hour you will have reached what appears to be the highest point on the rim (my GPS actually gave a reading of 1,961m). From here you can peer over at the fumaroles and they continuously bellow gases into the air. 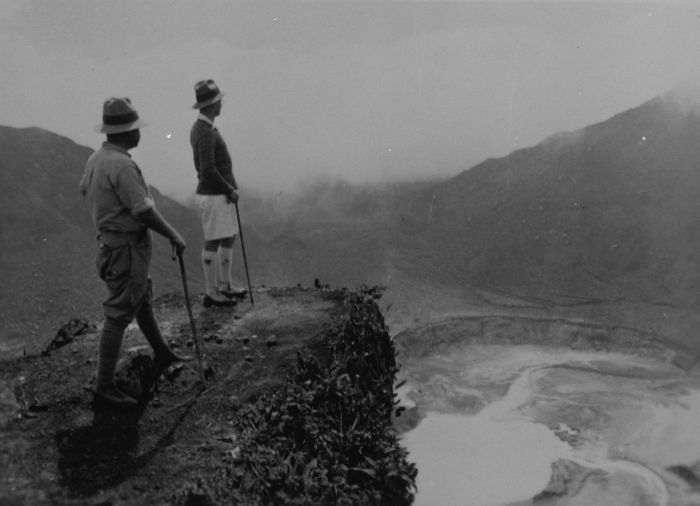 The old photograph of two Europeans on the crater rim in 1936 was taken somewhere around here. If you look to your right (westwards), you will see a forested peak about one kilometre away, to which there appears to be no trail. Based on various analyses it seems that the true highest point of the entire Kaba range is over there in the undergrowth, just a few metres higher! Unfortunate, but it doesn’t seem like you can truly bag Kaba at this moment in time. That said, should anyone have the Bakosurtanal map for the area we would be very interested to see what elevation figures they provide for both the rim and the western forested peak. Anyway, not reaching the highest point isn’t such an issue when you are surrounded by such otherworldly beauty as this. After reaching a second cement marker, the trail drops down a little before flattening out on its southern side for quite a while. There are some lovely views down to valleys and villages to the south. Eventually the trail leads up again to the final major ‘peak’ of this crater, which is also home to the third cement marker (1,930m). Before you have reached this point it will be obvious that there is more to this volcano than a single large crater. Indeed, this peak overlooks a narrow, steep ridge leading directly back up to the starting point. But there is a second crater to the east! The insides of both of these craters can be reached on fairly well-defined paths from the col at the lowest part of the ridge between the southern peak (with the third cement marker) and the staircase peak. Indeed, if you’ve visited on a weekend then you may well see local students down there getting dangerously close to fumaroles! Unless you want to get dangerously close aswell, it is recommended that instead of trying to clamber back up to what looks to be an incredibly dangerous and demanding ridge in parts, you continue eastwards, following the path that leads around the rim of the lower, eastern crater. This crater is active too, perhaps moreso, given that the activity in the entire complex appears to be moving slowly eastwards. This crater is a deep, evil-looking pit which belches smoke. Even better, further round on the far side of this rim you will see a smokey blue-green lake inside it. You will also see another shallow crater further east with a small, shallow lake. From that side you will also see a deep, side crater in the rock walls just below the southern peak. All of these craters can make it difficult to explain the different places on the mountain, especially as few names appear to have been universally agreed upon. Starting from the west, we essentially have the following: In the far west is Bukit Hitam (or ‘Itam’ – Black Hill) a forested mountan about 1,886 metres high. Next is an ancient, forested peak which appears to be the True Peak of the range. Third, we reach the crater rim of the largest of Kaba’s craters. On this rim we have three main peaks – the staircase peak, the highpoint of the rim and the southern peak. Next we have this smaller crater, the pit belching smoke, and within it is the mini side-crater formed in the crater walls beneath the southern peak. Next we have the small, shallow lake crater and finally we have an outlying crater which became active in 1950-1951. 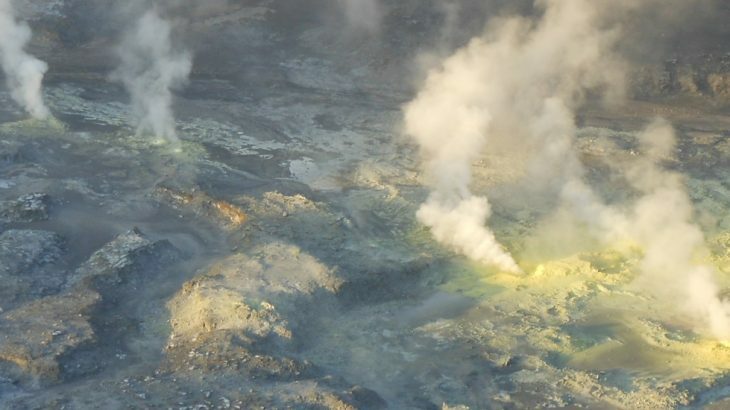 It appears that the latter is known as Kawah Vogelsang (Vogelsang Crater) presumably after a European geologist but it remains unclear – perhaps Vogelsang is the pit belching smoke? Hopefully in good weather it will be perfectly obvious how you can get back to the starting point at the staircase from the second active crater. Simply follow the edge of the steep rim (peer down at the blue-green lake!) back up to the cement fence or cut across to the parking spot. You may well spot several tents near the parking spot. The aforementioned jungle path from the villages is very popular at weekends with local student hikers who climb the volcano properly (no motorbike!) on the alternative route and camp just 5 minutes away from the staircase. It’s a truly beautiful and fascinating volcano complex. Recommended to all keen hikers – even adventurous families who don’t mind hanging on to the back of motorbikes for half an hour! Getting there: Lots of transport options between Bengkulu and Lubuk Linggau. A seat in a shared car (‘travel’) costs Rp65-70,000 one way from Bengkulu to Vila Hijau (2 and a half hours, 100km). The closest airport is at Bengkulu or Lubuk Linggau and the closest railway station is at Lubuk Linggau. Accommodation: In Curup you have the Mutiara and the Wisata Baru. However, it is much nicer to stay 20km from Curup near the junction for Bukit Kaba, preferaby at the excellent Vila Hijau which is on the main road about 1km east of the Kaba junction. Permits: If arriving between 8am and 4pm you will be asked to buy an entrance ticket at the gate. Water sources: It is best to take your own due to the high sulphur content. 2 litres should be more than sufficient for a circuit of the rim. Java Lava climbed Bukit Kaba in May 2016. It is indeed a truly beautiful and fascinating volcano complex as Dan describes. The mountain has a low profile and is referred to locally as bukit (‘hill’) rather than gunung (‘mountain’). With an early start, trekkers could circumnavigation the rims of Kawah Hidup and Mati, as well as descend to their floors in one day. The camp site on the upper slope of the forest track is noisy on weekends with local campers; the site at the base of the lookout is in fact a motor bike park. A more preferable site might be an open, flat area between the Mati and Lama craters. No water on the mountain. Guides/porters are available at Pos Wisata Bukit Kaba (park entrance), 0857 6814 3833. Vila Hijau, Curup (about 1,100 m) is highly recommended: Pak Dayat, manager, 0852 8443 0333, can arrange cars to/from Bengkulu and park entrance. What an absolute beauty this one was! One of the nicest hotels I have ever stayed in – Vila Hijau (Jl Raya Curup-Lubuklinggau No 99, (0732) 325333 – beer, karaoke, fine views, good ‘kentang goreng’ and ‘mie kuah’ and fruit juices all at very reasonable prices. And weirdly on a Saturday night I appeared to be the only guest, or almost the only guest. A lovely spot to take it easy. I arrived in Bengkulu on Saturday morning, took the regular airport taxi (a rather steep Rp75,000) to a ‘travel’ office where I waited around an hour before getting in a car bound for Lubuk Linggau. The car was full of peasants carrying chickens so I can’t say it was a marvellous journey as we snaked up into the hills. However, there are a couple of very steep little hills like mini Gunung Parangs on the left side about 40 minutes outside Bengkulu. Further up into the hills there was a sign saying a Rafflesia was blooming (rare – maybe only 3 or 4 days per year) but how far it was from the road was irrelevant really as the others wouldn’t be keen on stopping. 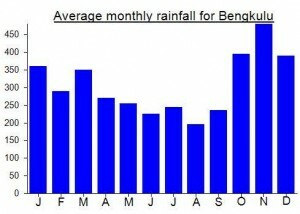 Ask about this if you visit – between 500m and 700m above sea level there are quite a few in the forests here. Had originally planned to stay at the Hotel Mutiara in Curup but didn’t see it and the driver clearly couldn’t understand what I was asking for so I ended up – luckily – at Vila Hijau, very close to the mountain and in peaceful and pleasant surroundings. At 1,100m above sea level the perfect temperature. A very nice chap at reception asked his friend Harmas (0812 78550999) to pick me up at 5.30am and take me up to the cement steps at the crater, wait for me and bring me back. Rp200,000 – a litte bit pricey maybe given the short distance, perhaps you could get it for Rp150,000 if you wanted to bargain. As you can read above I had a great time doing a circuit of the double-crater in about 2 hours. No technical climbing at all so long as you don’t try to do the short cut back up across the middle of the two main craters. A great volcano. Easily explored in a regular weekend from Jakarta if you take the first Lionair flight on Sat am and last one back on Sun pm.